Are you wondering if laser resurfacing is the right treatment for you? It’s a procedure that’s talked about a lot today in cosmetic medicine, but who needs it and why? Also, are you wondering why there are so many different resurfacing procedures and devices available? Does it all seem too confusing or overwhelming to you to choose one, specific procedure? If so, then you’re probably not alone. In the past several years, new laser technology has brought us many options to choose from for laser resurfacing. This page should help you understand some of your different options as well as which choice of procedure may be right for you and your needs. 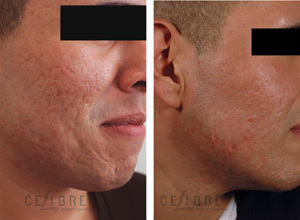 At Celibre Medical, we typically talk about laser resurfacing in one of two different ways: procedures that have downtime (time away at home recovering) and those that don’t (no downtime). Here, we’ll discuss downtime procedures. These laser resurfacing treatments can help with almost any skin problem that deals with your skin texture: wrinkles and acne scars are just two of the most common reasons that we choose this type of resurfacing. These procedures work because they remove a portion (or all) of your skin’s top layer, also known as the epidermis. By carefully injuring your damaged skin in this way, we can force your body to make new, smoother, healthier looking skin. In addition to the changes made on the surface, these devices also produce changes deeper within the skin, the dermis. Fractional (Fraxel, Sciton, etc) resurfacing generates incredible amounts of heat or thermal energy which in turn, stimulates your body to make more collagen. Collagen is what gives our skin is pliability and firmness. 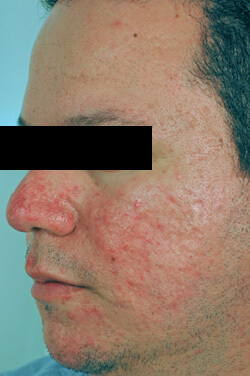 So, these lasers are capable of plumping and firming your skin in addition to smoothing out the surface irregularities. There are a lot of different devices out there that can be used to perform these types of resurfacing procedures. Currently, the most popular ones are erbium lasers, CO2 lasers, plasma treatments and various types of fractionated lasers. Each has its own benefits and drawbacks and while you may ask, “why so many?”, it’s actually a good thing that we have so many different choices! This allows us to craft a perfectly tailor-made treatment plan that totally fits your needs and helps us better achieve your treatment goals. Twenty years ago, this wasn’t possible; one-size-fits-all was the only approach we had, but today, that has all changed! 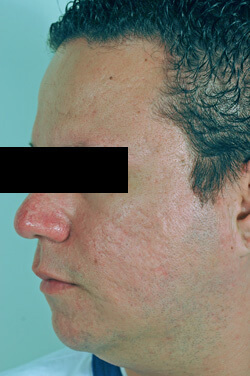 As a rule, most people will need a series of laser resurfacing treatments to see significant improvement in their skin. Remember, these are more aggressive treatments that will require you to recover at home for anywhere from 5 to 7 days (social downtime), but each successive treatment builds on the improvements made in the last one. Although three is the minimum number, some people with more severe damage to their skin may need more than that to reach the optimal improvement in their skin’s tone, texture and color. Give us a call today if you’re interested in learning more about if laser resurfacing is right for you. Your consultation is free and we’d love to the chance to explain how our laser resurfacing program can help you achieve smoother, firmer and younger looking skin.